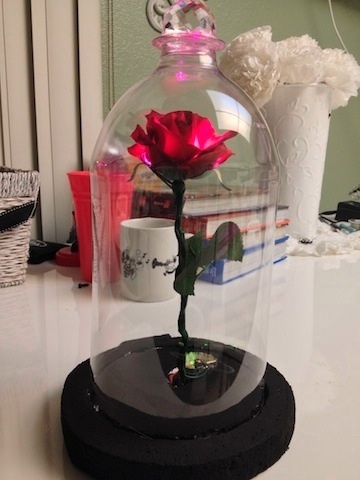 From the Forums: Beauty & the Beast Rose for school play #neopixels « Adafruit Industries – Makers, hackers, artists, designers and engineers! …Now, I just need perhaps some NeoPixels and a GEMMA or something, to make the rose petals appear to glow solidly, then dim to off one by one at separate time intervals to represent the enchantment dying away throughout the show. 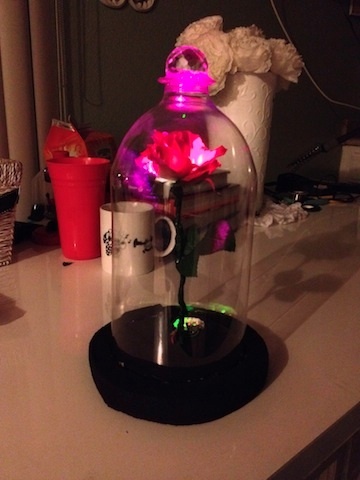 I figure I could probably sew the NeoPixels into some of the synthetic petals and mount some into the foam base of the bell jar for more luminescence. Then using some micro controller to pre-program the dimming sequence so some kid theater-tech can sit literally behind the scenes and push a single button for the dimming to occur. …I used the “Space Face LED Galaxy Makeup” as a template for hardware and code, only modifying the RGB values to (255,0,50) for something a little more “rose color”….